After threat of bad weather caused a necessary reschedule, guests gathered Wednesday, February 27 at Ardenwoods for our first event of the year. Edward Jones advisor, Doug Rostick, delivered a presentation about how technology will change the way that you age. As we age every day occurrences such as going to the grocery store, driving to the park for a walk or communicating with our loved ones can become more burdensome. Rostick addressed the advances in technology that make maintaining your every day life easier. Everyone understands the allure of retirement communities that advertise exciting resident events. Having a thriving social life as you make the transition into a retirement community is extremely important. Fear of giving up freedom is what discourages many people from choosing to downsize. At Ardenwoods we not only offer events planned with our residents in mind, we also offer resident planned events! This Valentine’s Day we helped a couple of residents coordinate to throw “Sweets to the Sweet in Verse and Dessert,” a resident-lead community event. Our Rocking Chair Readers group joined forces with Dona Marie Nelson to present a special poetry reading with a specialty dessert reception to follow. 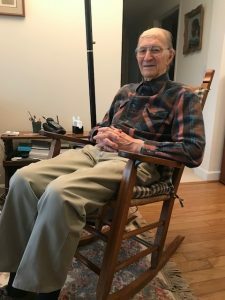 Paul Bryant, who helps to lead the Rocking Chair Readers group at Ardenwoods offered to focus the group’s efforts on putting together a poetry reading in honor of Valentine’s Day for the community. Shortly after, resident Dona Marie Nelson approached Kari Schrader, Community Life Services Director at Ardenwoods, about hosting a specialty dessert reception for the community. Schrader couldn’t help but envision a joint event to celebrate the holiday! Each Ardenwoods resident received a personal invitation to the event as well as reminders posted around the campus. 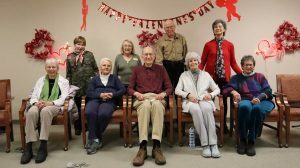 What occurred was a lovely gathering of about 50 residents on Valentine’s Day to enjoy live poetry and dessert. At Ardenwoods we take pride in how community minded our residents are, and encourage them to bring activity ideas to our staff. We love having engaged residents who not only look forward to events, but also want to contribute in any way possible. 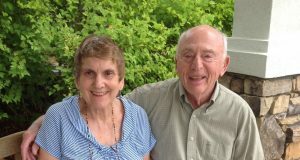 Thank you to Dona Marie and Paul for all of your hard work and your commitment to our community!